My first thought was to recreate my favorite which is the peanut butter buster parfait from the local ice cream shop but couldn't translate it to anything. I settled on a twist of chocolate and vanilla in a cone and then added sprinkles at the last minute. Yummy!!!! 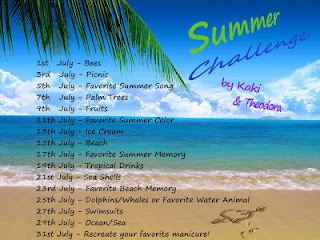 OMG, this looks amazing...love the idea that you made one big ice cream! This is so amszing! I love how its a full hand design! This is seriously amazing! I love those sprinkles, I can't stop staring! 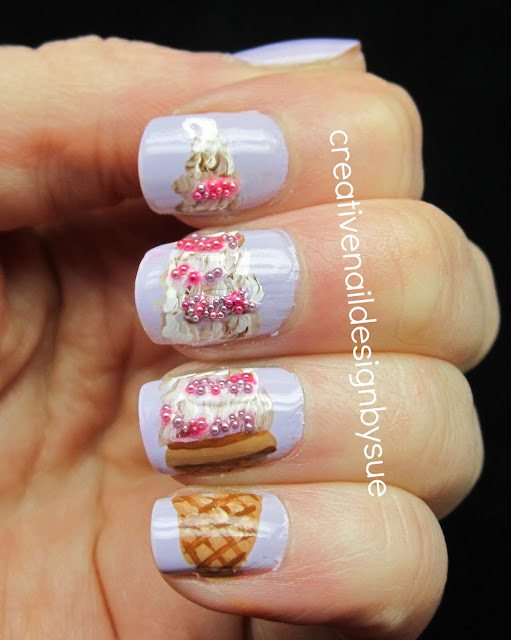 This is absolutely amazing, and it makes want an ice cream right away LOL - perfect mani, love it! OMG this design is amazing! You did such a good job. I hope you're proud of yourself with this one. Freaking fantastic!! wow....that's my kind of ice cream. Wow this looks so yummy! I had a vanilla soft serve cone earlier today...your nails makes me wish I had one right now! It's beautiful! I love the sprinkles. This is amazing!! Pretty as a picture :] and I love the sprinkles, what a great addition! I am totally loving this mani!!!! This looks beyond amazing..you rocked this out!! Love, love, love it. Oh my gosh, that looks so real!! Wow! I love this! it's so amazingly realistic!! This is amazing. You did such a great job. Now I totally want to eat that ice cream! These are insane! So cute!